Last night, congressional Republicans came home to rooms full of angry people. At town halls across the country, conservative lawmakers were protested, heckled, and shouted at. A few unfortunate souls were even asked to explain — in detail — the GOP plan for replacing the Affordable Care Act. But Republicans aren’t worried. They’re onto liberals’ cute little game. They’ve realized that these so-called “protests” are, in truth, tactical demonstrations — planned, in advance — by people who want to bring about political change. At first blush, this tweet may seem like another eccentric outburst from our tweeter-in-chief. Why would anyone think that protests are illegitimate simply because they’re planned? And yet, this seems to be a genuine Republican talking point. Two days before Trump’s tweet, Texas senator John Cornyn shared a New York Post article that also tries to discredit the protests by claiming that they are strategically organized. To be fair, “the protests are planned” is a considerably more honest line of attack than the “paid protesters” claim that preceded it. (Presumably, someone realized that if George Soros really were paying every anti-Trump protester, the liberal billionaire would be responsible for more job creation than the president). It’s legitimate for conservative commentators and politicians to highlight these tactics. 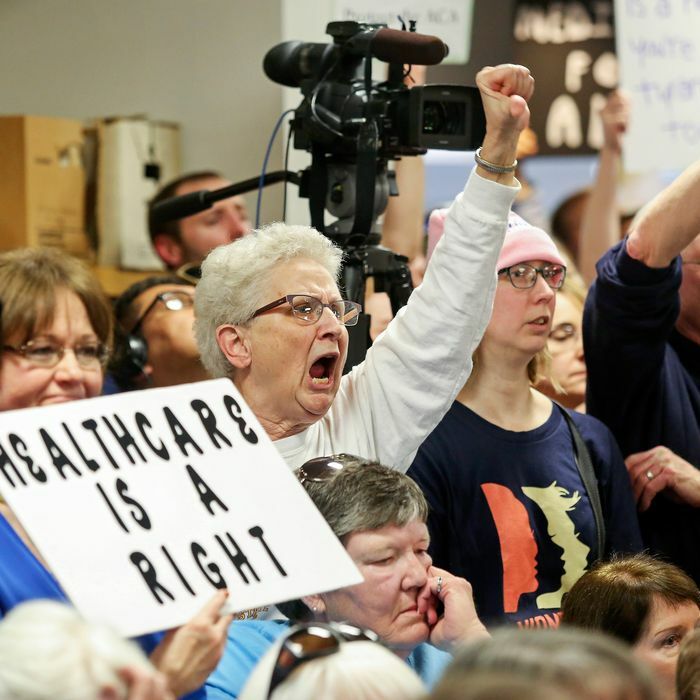 And, for many Republican House members, it’s probably true that town hall protests give a false impression of the scale of dissent in their red districts. But there’s still a certain comedy to these complaints. The “training manual” Sperry stumbled upon was drafted by Indivisible – an organization that is not formally affiliated with Barack Obama or OFA – and has been proudly shared by Democrats and liberal activists over social media for months. The central charge of Sperry’s op-ed is that Organizing for Action is, in truth, an Obama-aligned front-group whose true purpose is … organizing for action. Of course, the audiences at these town halls aren’t perfect representations of district-wide public opinion. And of course, professional political organizers are trying to channel liberal outrage in productive directions. This is how politics is practiced on both sides of the aisle. Earlier this month, the tea-party-aligned outside group FreedomWorks announced that it will be organizing rallies and town hall counter-protests in support of Obamacare repeal. OFA’s “training manual” isn’t what’s unusual here. What’s unusual is the number of people eager to study it. Activists do try to create an exaggerated impression of public support for their goals. But the more people they organize, the less hyperbolic that impression becomes.